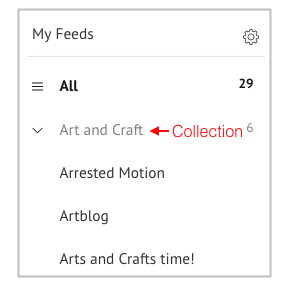 What is a Collection and how can I create one? Collection makes finding a particular type of content easy. It is a way to group similar content sources (blogs / Pinterest boards). For instance, here, Art and Craft is the collection and Arrested Motion, Artblog and Art and Crafts time! have been grouped under Art and Craft. Whenever you follow a content source, you'll be asked to add it to a Collection. You can either use an existing Collection or create a new one. Now to view the content sources that you're following, go to My Feeds and choose any Collection. You'll see the content sources for that Collection. 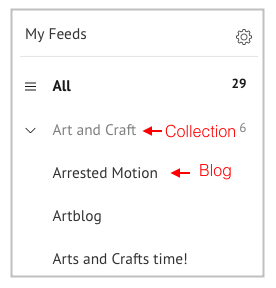 How can I add content sources other than the ones in Popular Feeds?